I made the point in my last post that many developing countries could be hard pressed to meet their 2020 emission reduction goals simply because the clock was now running against them. The reality is that from a major infrastructure point of view, the 2010’s are largely a done deal, at least in terms of new hardware. If projects are not already in the pipeline or at the very least represent an expansion of an existing, relatively mature business area, then they will not materially impact the emissions over this coming decade. Some variation in expected emission levels may come about from spurts or slumps in economic activity or through additional fuel switching, but this will largely be at the margin or be the result of initiatives already well underway (e.g. the growth in US shale gas). At an industry meeting in London this week the CEO of the UK Climate Change Committee outlined their thinking on forward targets for the UK. This follows their release in December last year of The Fourth Carbon Budget report, which specifically covers the period 2023-2027, but also includes a clear indication of where UK emissions need to be in 2030 and the pathway that will therefore result in the period 2030-2050. There was almost no discussion about 2020 as the CCC clearly recognizes that major projects in their infancy today, such as the nuclear power stations now being considered, won’t even start up until 2018-2020 at the earliest. Although a shift in the existing EU target of a 20% reduction by 2020 to 30% remains a political discussion point, in reality the bureaucrats (at least in the UK) have moved on. Their sights are on the following ten years. This isn’t to say that we can relax now, quite the opposite. Sufficient impetus has to be given to the energy system now to ensure that the project activity that will deliver the reductions needed by 2030 actually starts in earnest. Delivering CCS, building new nuclear plants and so on not only have long single project lead times but also have much longer lead times required to see the necessary industrial, financial, political and civil society changes required to support them as an entire sector. 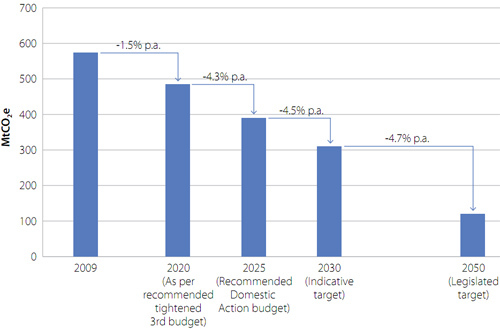 For the UK, the Climate Change Committee is proposing an indicative 2030 target to reduce emissions by 60% relative to 1990 levels (46% relative to 2009 levels). According to the report, an implication of this is a near zero emissions power sector by 2030, which represents a very considerable shift from the situation today. It also means that large scale project activity must accelerate from the current level. The UK is thinking about much of this in terms of additional domestic policy, but the power sector in the UK is part of the EU-ETS, which is where the work should be done. For the EU this has important policy implications. It wasn’t that long ago that the Commission finished with the design of Phase III of the EU Emissions Trading System and in reality the finer points of areas such as benchmarking and auctioning are still being thrashed out. But waiting another four or five years to repeat this process for Phase IV (2021 and later) is no longer a tenable option. This is the year to develop Phase IV thinking and 2012 is the time to take it to the EU Parliament. The market needs the clear direction that such a move would give.